Most people are pretty tight-lipped about their income and not many want to talk about their debt either. I guess that’s what makes us weird. We talk about both… in detail! Strange or not, talking about our debt and income by sharing it with the world has been a huge part of our success. Being accountable to you, dear reader, while intimidating (and even embarrassing), has kept us going and fired us up to achieve our goal. When we set our goal, it was quite a stretch goal, with no real foundation in numbers or mathematics. In other words, it looked impossible! We are not only going to achieve our goal, but we’re on track to hit it earlier than we had scheduled. It’s a huge blessing that I can hardly wrap my mind around. Don’t underestimate the power of a goal, my friends! May was a good month. Here are all the details! In May we paid off $5,762 in debt! The money for this debt payment came from last month’s income. It represents almost 60% of that income. We’re excited that it finally puts us under $20,000 of debt remaining! On one hand, $20,000 is a lot of money, but on the other hand, with the momentum we’ve built up (and how far we’ve come) it doesn’t seem like much. Please don’t be discouraged if your debt repayment doesn’t look like this. We are in the homestretch of our repayment now, so we have minimized our expenses and increased our income and our repayment is now flying. It wasn’t always this way though. We were going slow and steady for a long time before we built up momentum. 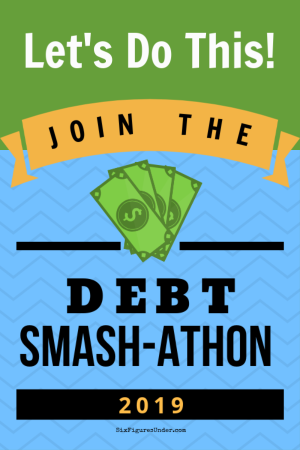 If you’re just getting started paying off your debt, my free Smash Debt email course will go through the 7-step method we used to get to where we are. Our total net income for May was $13,996. Since we live on last month’s income, this is income that we haven’t used yet. We have it budgeted to spend in June, which will be a great thing for June’s debt repayment! Attorney Income (Private Practice)– $4,539 On top of working full-time (with a three-hour round-trip commute), my husband has his own private law practice on the side. The days are long and won’t be sustainable for the long haul, but right now the extra income is really helping us tackle our debt. Working completely alone means he has to do everything, and (oddly enough) sending bills out is never at the top of the list. I mentioned last month that the goal for this month was to send out a big backlog of bills. In the spirit of following up, he got most of them done in the past couple of days. Hopefully he will have lots of checks come in this month for work he has already done. My Income (Blog)– $4,331 The income that I report is the income that I received this month minus all of my blogging expenses. I had received a big affiliate payout that I earned earlier in the year, making this my highest month ever for blog income. My expenses were also the highest they have ever been, as I set aside a big chunk of income to purchase a new laptop. You would laugh if you saw the one I use now. It’s missing a dozen keys and the main mouse button doesn’t work, and it’s as slow as molasses. I usually use the desktop for obvious reasons. If you’re interested in the details of my blogging income as well as other blogging tips and resources, you can sign up for my Behind-the-Scenes Blogging emails to get the scoop. If you want to start your own money-making blog, check out my complete step-by-step instructions for setting up a self-hosted blog and the resources I recommend for starting a blog on a budget. Tithing– $971 We happily pay a 10% tithe on our total income from the previous month. You can read more about why we pay tithing even though we’re in debt. Other Giving– $80 Other charitable donations this month. Internet– $0 Thanks to some legal work that my husband did for our service provider, we will have free internet for a while. It’s nice to stretch our budget by bartering, though we will still pay income tax on the fair market value of Internet service come tax time next year. Republic Wireless Cell Phones– $27 We switched our Republic Wireless phones to the new Republic Refund plans. With our refund for the data we didn’t use the month before, I ended up paying under $12 and my husband paid under $15 for our plan. That includes taxes too! You can read about getting refunded for cell data you don’t use here. Health Insurance– $739 We have our insurance through my husband’s employer. This is the portion of the insurance premium that his employer does not cover. It includes dental and vision insurance premiums too. The portion that comes out of his paycheck will go down after he has worked at the state for a year. Car Insurance– $59 This is lower than usual to make up for overpaying last month when we paid for three vehicles but took the third off of the insurance near the beginning of the month after retiring it. Our auto insurance is great. In addition to the wonderful coverage, they also give us dividends at the end of the year, which is always a nice treat. Food– $315 We went over $300 two months in a row, but I’m not going to beat myself up about it. Gas– $265 My husband is able to telecommute several days each month now, which provides a nice reduction in the gas budget! For the record, gas is about $2.59/gallon here. Clothing– $0 I ordered some clothes with ThredUp credits I had that were going to expire, but we didn’t spend anything out of pocket on clothes this month. Household– $31 The mouse for our desktop computer was on the fritz and finally gave out, so we got this one. The wireless-ness is great, but we’re having to train ourselves to not leave it near the edge of the computer desk, otherwise a really cute little one-year-old will run away with it. In addition we bought a few normal non-food kitchen things (like sandwich bags and foil) and some toiletries. Entertainment– $29 We stayed two nights at a nice Airbnb rental last weekend. Between my tricks for saving with Airbnb and some credits that I had been accruing for a while, the stay was free except a $25 cleaning fee. We also rented a couple of movies. Car Repair– $237 My husband replaced the brake pads on his car. He also started replacing the shocks on the van, but our mechanic had to finish the job because one of the shock bolts was broken off inside the mount. Car Registration– $89 We paid the annual vehicle registration on the blue van. Gifts– $25 A gift for my son with a summer birthday. Library Fines– $31 The majority of this is from a book that one of my children (who shall remain nameless) destroyed. While it’s frustrating to pay library fines, I’m pretty happy that for as many books as we check out from the library in 8 years of having kids, this is only the second book we’ve had to pay for. The other one was “lost” (though I’m really quite certain I turned it in). Kids’ Summer Activities– $280 Earlier this week, I wrote about the 3 activities that we’re paying for this summer. This covers the swim pass for the local pool and the Kids Cook Real Food course (which we’ve started and are loving!). Retirement– $484 With my husband’s state job, this amount comes directly out of his paycheck and into his state retirement. While we have some retirement savings from our before law school, it’s nice to finally be contributing again. Well that was May! I’m excited for June! We’re going to try extra hard to keep expenses down and income up in June. We are so close! Wow! Way to go, Stephanie! These numbers are awesome! Yes! It is feeling close (which really does sound outrageous because $20K is still so much money!). Hmmm . . . I’m curious to see if you break the $10k barrier in the next report w/ this month’s income – you are so so close! We are in the slow-and-steady phase right now, but I hope that we will find a way to boost our income over the next couple of years to make more progress. Me too! 🙂 I’m planning on it. Slow and steady is good, for sure, but I hope you have an income breakthrough soon too Jenni! Wow! You are really picking up speed! Thank you for sharing so much! It’s been really awesome to be able to read some of your great posts when I am having a “down” day. Keep up the good work! You are soooo close now! Thanks Dianne! I’m glad my posts can be encouraging! Way to go! Those numbers are amazing!!! I pride myself on never having paid a library fine. Growing up my mom was the town’s librarian, so I had a pretty easy way to get out of them! At the end of last year we got a note from school saying we’d lost a book. Like you, I’m positive I turned it in. I upended the house looking for it; couldn’t find it anywhere. When I fronted the school librarian and said I couldn’t find the book and asked how much I owed she said, “Don’t worry about it. I’m supposed to weed out a third of the books every year anyway, and I never do. I just let the kids do it for me through lost books.” The winning streak continues! While our only debt is the mortgage, our big goal is to pay cash for graduate school. We have three payments left through January of 2017 and our huge tax return will cover two of them. My big excitement this month is that I won one of the scholarships I applied for and it was for $2500! Now we only need $1500 more by January to say we made it through grad school debt free. I am still applying for as many scholarships as I can. Congrats on the scholarship Jen! That’s awesome! Paying cash for grad school is amazing! I don’t want this to sound detrimental to what others have accomplished at all, but I have followed several other bloggers in their debt repayments, and a few of them suddenly seem to become somewhat bully-fied once they are debt-free. All of a sudden their writing seems to belittle those who have debt for any reason (be it medical, educational, or downright consumerism) and seem to forget they were in those same shoes a few months earlier. I don’t pick up on that from you, especially when you yourself acknowledge that things were ‘slow and steady’ for awhile. I love how you create joy through your posts. Your enthusiasm for what is happening to your family comes through. Yes – I’ve seen this too, and it frustrates me. We aren’t in debt; but I know that’s largely because we’ve been incredibly blessed. And there are so many people who are in debt who take this bullying on-board too, and participate in self-bullying because of their debt. I remember once reading a comment by a woman who was beating herself up and calling herself stupid for being debt. She was in debt because another car had hit her, totalling her car and causing her to rack up serious hospital bills for herself and her child – she was pregnant and had gone into labor prematurely because of the accident. And she was blaming herself for having debt to replace the car and for having debt from the hospital bills! And I was just floored. How is any that her fault? Sometimes debt is just unavoidable. We do our best; but life has a nasty way of getting in the way. It doesn’t mean that the person who is in debt is somehow inferior or stupid or less worthy of love. At the end of the day it’s just money. Some people have a lot and some don’t. But it doesn’t have any bearing whatsoever on who you are, as a person – on your worth as a human being. Beautifully put Becca! It’s just money and it has nothing to do with your individual worth! Congrats, Stephanie! That’s huge! I have been really inspired by the way that you both have worked so hard to supplement your incomes. I am in the blog-building stage, so it’s also encouraging to see how you have grown your blog income over the past year. Thanks Sarah! 🙂 The one who really works hard is my amazing husband. I don’t know how he keeps it up! Hooray! Won’t be long now! You and your family are getting so close to being debt free!!! It’s been a busy few days and I’ve been meaning to check in and see if you posted your monthly debt repayment report. I’m so happy for you and your family!!! Keep at it! You are so close to the finish line! Thanks Midori! The excitement is mounting as we near the finish line. Thanks for being so encouraging! WOW! You guys have come some far and are sooo close. Finish line in sight-congrats! May was an expensive month here as my oldest graduated from high school. Between a few small gifts, one large gift we went halfsies on with a relative, dinner out afterwards, and the party, it had a pretty hefty price tag. But we had the money set aside way before the big event, so we could well afford it, which was terrific! Now on to our next personal goal- getting that mortgage down to the point where the principal paid each month is organically more than the interest paid in each required payment. We’ve been throwing roughly an extra $300 a month at it. Looks like August should be the payment that tips it! We are 13 yrs. into our 30 yr, about 4 years ahead on it, and hope to finish up roughly 7-8 years early. I wish we knew at the START of our mortgage what we know now about personal finances as we’ve only been after this the last few years, but better a late start on really slaying it than never! Things should be calming down, financially speaking, in June over here, so I’m looking forward to that. Cheering you guys on as you slaughter that last $20k! Holy cow – your husband is working for the state of California AND has his own solo practice on the side (which is making more money than his day job)? AND you’re killing it as a blogger. Very impressive. Can’t wait to learn more about you. Into the archives I go. Ha, thank you! My husband is working really hard right now. Before starting to work for the state (in the fall of last year) he was in private practice (though not his own firm), so he hasn’t had to do any work to get clients. They just keep coming, which means he is super busy right now. It’s definitely not sustainable for long term (right now he works from early in the morning until after midnight 3-4 nights a week), but for now it’s a huge blessing. And it happened to be a good month of blog income, as this is double what has been the norm lately. It has been so amazing to watch that debt go down. You guys are rock stars at getting rid of it. I look forward to your first post after you do not owe anything. I know that you were discouraged when you saw the price of homes where you live, but your and Mr. Sixfiguresunder totally have what it takes to gather your down payment in whatever time frame you pick. I love to see hard working people achieve their goals. It creates so much hope. Thanks for the kind words and encouragement Linda. 🙂 We have talked about it a lot and I think setting a solid goal (rather than just trying and hoping to pay it off as fast as we could) really has made a huge difference. I’m excited to set a new goal when we’re done. Awesome! I’ve been following your blog for a while now, and it’s so great to check it every month to see how you’re doing. I just signed up for your “Behind the Scenes” blogging emails too! Thanks! Hey Stephanie! I just stumbled upon your blog because one of your posts about blogging came up in my Pinterest feed, but I’ve been poking around and you really are inspiring me! I too have quite a good bit of law school debt and just can’t figure out where to start with paying it off (other than the monthly payment of course)! I’ve started my own blog to try and help with it, so hopefully that will help! Anyway, just wanted you to know you have inspired this stranger and I’m adding your blog to my feed so I can keep up with your progress. Congrats on everything!